My friend Laura, The Joy of Cooking Fairy, is hosting her first blog contest. You should enter. There are lots of reasons why- but the most important is the trying. You can't win if you don't put yourself out there. I'm not a creative person, but I am a great editor. I can adjust things and make them juuuuuuust right. Laura says that's okay, and insists that it *is* creative to make fixes. I'm still not sure I entirely agree, but that's neither here nor there. This is my contribution to her contest. 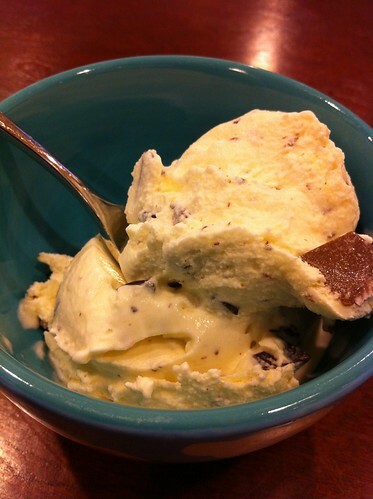 Because I'm me, I think there's nothing better than homemade ice cream for dinner, *especially* on my good china. Let's face it, it doesn't really matter what you eat for dinner anyway if you have a spectacular dessert; a phenomenal dessert can completely eclipse a merely "eh" meal. Coexist is based on an ice cream we had ten years ago at a place called Urban Ice Cream in Campbell. Urban Ice Cream was solely responsible for my 40 lb weight gain at the end of 2001, most of which I still carry around with me. They had a small range of exceptional, original flavors, and when they closed, it was a loss I felt deeply. Since I am both brave and have the tools, I decided to make an attempt at making Andrew's favorite flavor, one that they called "Diversity". I take the Ben & Jerry's sweet cream base, follow the directions exactly, and then I add a little flair. Once the mixture has cooled, I pour the ice cream into the machine (I have this one), and let it run for 25 minutes. During those 25 minutes, I chop 1/4 cup each: semi-sweet chocolate, milk chocolate, and white chocolate. I use good chocolate because you don't need very much, and also? Good ingredients make for a most excellent finished product. That is a total of 3/4 cups of chopped chocolate. I recommend tasting them, to make sure that the chocolate is adequately delicious. Of the 1/4 cup of each, I chop 2/3rds finely, and leave that last 1/3 coarse. (Did that just make your math brain explode?) You can eyeball it, I promise nothing bad will happen. When the 25 minutes are up, slowly add the chocolate to the mixture, and let the machine run for about five more minutes. Scoop it into an container to be frozen, and make sure to get every last bit out of the ice cream bowl. Preferably with your fingers, because it tastes better that way. Scoop into beautiful china, and share with your loved ones. I totally thought that was a chunk of bacon in the picture! One of our local ice cream places has a maple bacon flavor that everyone loves. Everything good in life comes from tweaking, adding on and editing. Yeah, fire, great. Applied to mammoth chops? YAHHOO! See what I mean? Kudos for entering! Is this recipe from Evil Jasmin or Wicked Jasmin?